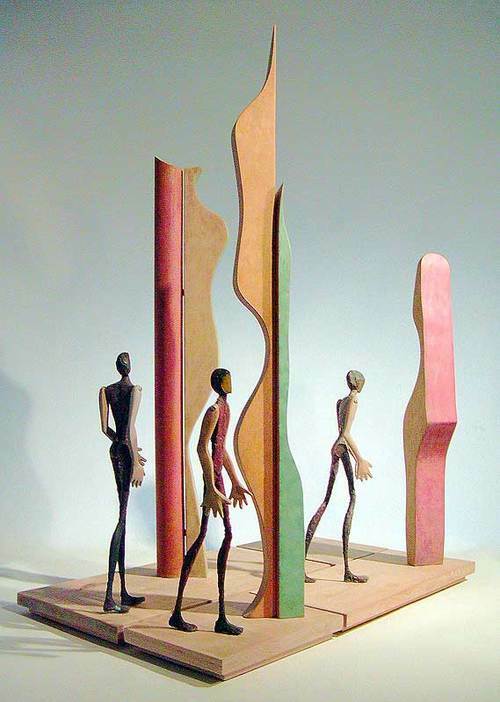 Painted bronze and wood, last revision 2003, 23" x 16" x 29". Going it Alone began as Moving Toward Consensus. In 1984, voters rejected our local school's annual tax levy. Out of money, the schools closed, making the national news. Parents and community members were galvanized; the levy was passed on a second try. For the next six years, until a tax base finally passed by ten votes, an ever-changing group would mobilize in the Spring to attempt to pass an updated school tax base, and when it failed would rally again in the Fall to pass the then necessary annual school tax levy. We never agreed on why or how to convince voters to tax themselves for the common good, but we struggled on with a shared belief that closing schools was not an option. In 2003, schools closed early all around Oregon; services of every sort were slashed. Voters twice defeated measures to temporarily raise taxes to reinstate some of the harshest cuts, and the discussion returned to what to cut next, making decisions based on the viability of re-election campaigns. Moving Toward Consensus no longer seemed possible. I chopped the sculpture apart, isolating each person with their own biases and agendas. Individual taxpayers, political parties, unions, programs, niche groups are going it alone, while the choice to begin moving toward consensus lies dormant, waiting for the will and the determination to begin the struggle of working together for a greater good.